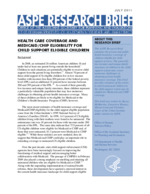 This ASPE Research Brief examines the private and public health insurance coverage of children eligible for child support services. The generally low-incomes and unique family structures of children in the child support system may create numerous challenges in obtaining private health insurance coverage. This brief provides estimates of the extent to which uninsured children in the child support system may be eligible for Medicaid and CHIP coverage. This brief was written by Stacey McMorrow, Genevieve Kenney, Allison Cook, and Christine Coyer of the Urban Institute under contract to ASPE.